1. 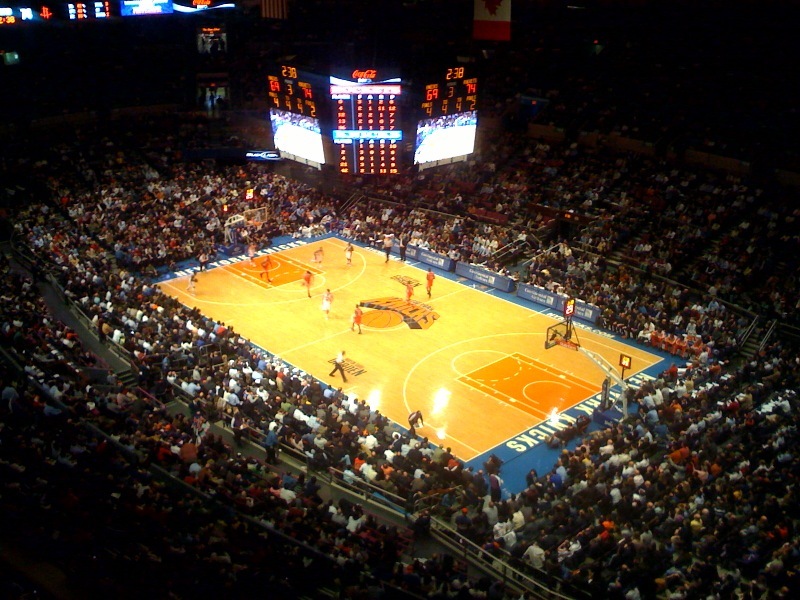 Madison Square Garden – He has said many times that Madison Square Garden is one of his most favorite places to play ball. Also, MSG continued to sell out and maintain the aura of a playoff game many times during this year (and the last few years) even when the Knicks (and Rangers) stunk it up. What other city has this atmosphere even when the team(s) has been horrible for 10 years? Most cities give up on the teams. Knicks playing at Madison Square Garden. 2. NYC badly needs a basketball savior – Giants won in 2007. Yankees won in 2009. Rangers won in 1994. The Knicks have not won since 1972-3, and only reached the Finals twice since then. Everyone saw how NYC treated the 1994-5 Rangers when they finally won. Imagine how the city will treat whoever gets the Knicks to the promised land. 3. The Canyon of Heroes – There is nothing like going down Broadway and the Canyon of Heroes in a ticker-tape parade, being celebrated by three million+ fans. The history of the Canyon of Heroes goes beyond sports and New York. It is a big part of all that America stands for – valor, freedom, intelligence and bravery (Eisenhower, MacArthur, Glenn, Statue of Liberty, Einstein, Olympians, Lindbergh, Earhart, Jesse Owens, Armstrong, just to name a few of the 100+ parades). No other city comes close to offering that experience. None. 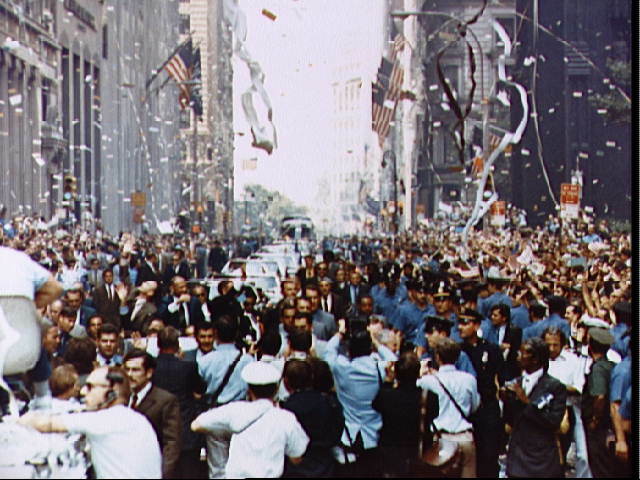 Canyon of Heroes Tickertape parade in 1969. 4. Time to leave the nest – As much as people say he won’t leave Cleveland because he’s a hometown kid, that reason may also be why he leaves. All college kids remember having to decide between going to a state school versus going out of state. The visions and dreams of leaving the nest grow stronger as you mature. It is a natural process to want to leave the nest and prove you are capable of taking care of yourself. Many of those that were hesitant about leaving home, end up loving the experience away from home. LeBron will be 25 next summer. 5. It’s just a part-time job – People make it seem like if he leaves Ohio, he is naked and all out in the world alone. Basketball season is from October to April. He has 4 to 5 months each year to live back home with his mom and friends, if he wants. Additionally, there is so much traveling going on during the season, most players see the team city as a job location and not necessarily a family-nest location. It’s more important that the city and fans embrace you. He will be embraced like no other in NYC. 6. James Dolan – He might be one of the most incompetent owners in sports, but there is one thing that he has, money. And he’s not afraid to spend it on the Knicks. Now that the management is sound with Walsh, LeBron can come here knowing the management will do whatever it takes to surround James with whoever he wants to win it all. 7. LeBron as pseudo-GM – LeBron will have a lot of input in which players the Knicks sign or let go during his whole contract. The Knicks entire hope is that LeBron signs with them. You think once they do, they will go against his wishes in bringing in a supporting cast? With Dolan’s money and Walsh’s management, LeBron does not have to worry about the current Knicks players being bad. 8. Don’t forget 2011 – Too much is said about how the Knicks will only be able to get one max player (and recently cleared space for two!). No matter what the cap is and whether they can unload Curry and/or Jeffries, both contracts come off in 2011. LeBron is not signing for one year, it’s a multi-year investment. 9. Mike D’Antoni – Every player, including LeBron, loved playing for D’Antoni on the US National team. His style is almost playground style – open, fast-paced and focused on athleticism – which Lebron loves. You can see how the Cavs offense slows down when Shaq is stuck in the paint. versus someone more fleet footed like Varejao when he’s in the game. LeBron is taking more fade-away jumpers instead of driving to the net. Additionally, the Cavs don’t do many pick-and-rolls which would greatly increase LeBron’s ability. 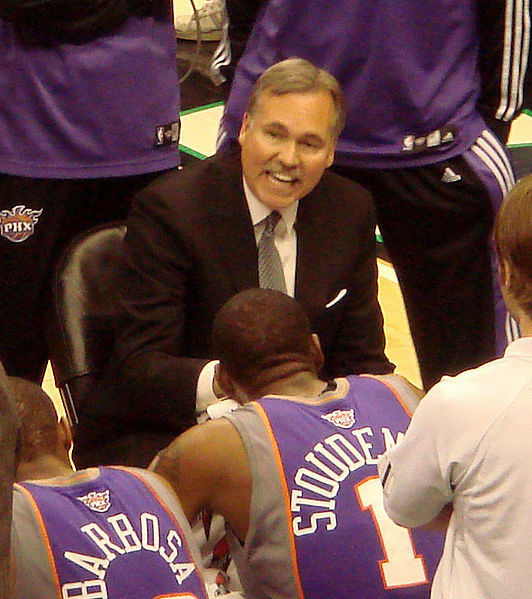 D’Antoni’s whole premise is the ability to efficiently do pick-and-rolls. Mike D’Antoni coaching the Suns. 10. CC Sabathia, Arod, Jeter and others – LeBron’s friends on the Yankees and Giants will simply tell him there’s no other city to be a champion in. That’s gotta be at least in his head seeing his friends enjoying the glory of being champions and beloved by the city. Not to mention Jeter winning SI’s Sportsman of the Year. If LBJ brings home the trophy in NYC, good chance he will be just that. 11. New York Yankees – LeBron is a big Yankees fan. Yankees will be contenders for the foreseeable future. If he sticks around in the offseason, he can enjoy many games in the new stadium and watch his buddy Sabathia pitch to his heart’s content. Not to mention the playoffs. 12. Giants and Rangers – Don’t know if LeBron is a big football or hockey fan, but it’s always nicer to be in a city where all the sports teams are contending and supported by the city. The Browns have been a mess for a long time. The Indians seem to be in constant rebuilding mode, having let Sabathia and Cliff Lee go. Not to mention that the Cavaliers were nothing for many years before James. 11. Charity – Yes, it’s true that charity can be done in any city, but charity done in a big media city like NYC just means more exposure and publicity for it. Look at Jeter’s Turn2 Foundation or Joe Torre’s Safe at Home foundation which he has not moved to L.A. and he still flies back to every year. 12. NYC media – Which brings us to the media. James loves the spotlight. He is accommodating to the media. Seriously, what athlete entertains the hypothetical idea of going to another city for so long before finally saying no more questions until after the season? He understands being a true superstar means winning over the local media. Winning over the crazy media of NYC is another challenge I think he finds exciting. 13. Local marketing – People talk about how going to NYC will not make him a bigger global icon. They talk about how he is already as big as he can get in the world. They talk about how he is second in China and fourth in Europe in jersey sales. One thing they are all forgetting is the local marketing of LeBron. Yes, he is already an icon in NYC with large billboards, but he is seen as an icon like Jordan, but not an icon they can call their own. Big big difference. Imagine the marketing prospects of that of a metropolitan area of 18 million versus Cleveland or even Miami. Only Los Angeles, Chicago and possibly Boston can compete with that. The added local marketing revenue is something he can not get anywhere else. And don’t forget Wall Street and the many Fortune 500 companies there. Everyone assumed that just because Nike doesn’t have a bonus clause in the new contract LeBron just signed that it means they don’t prefer to have him in New York. It would be too obvious, but trust me, they definitely prefer him in NYC. If LeBron does sign with the Knicks, they can mutually tear the current contract up and sign a new one. Think about it. Knicks have been horrible for many years. Yet they are fifth in Most Popular Team Merchandise and David Lee is 12th in jersey sales (and Nate Robinson is 11th!). It’s not little kids in the midwest buying the merchandise and jerseys, but the millions of fans in the NYC area. Don’t tell me local marketing doesn’t matter. 14. Basketball legends reside in Los Angeles, Boston, Chicago and New York – The stars from the big cities still command the most attention in basketball (and sports) history. Going back to sales rankings, 7 of the top 14 in jersey sales are players from the four cities, and the four cities are in the top 5 in team merchandise. An example is Tim Duncan. He has been such a consistent force for the past 13 years, and yet no one really cares or hears about him. I know he likes it that way, but if you want to be remembered, you have to go to the big cities. 15. It’s 5 players per team, not 9 or 22 – Unlike baseball or football where one player cannot take over a game day in and day out, in basketball, it can happen. Even a roster of 12 is much easier to improve than 25 in baseball or 53 in football. The Cavaliers is a perfect example. They were 17-65 the year before James was drafted. James single-handedly generated an 18-win improvement his first season, 35-47. What James wants to see is cap flexibility in the first and second years he is there, and also a willingness to spend by the owner. Knicks fit both. 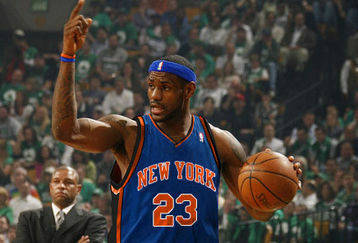 LeBron James in a Knicks uniform. 17. LeBron’s personal attention to Gallinari and Robinson – I know LeBron occasionally will whisper advice to the young players on several teams, but he has done it very obviously with Nate Robinson last year and with Gallinari this year right after the only Cavs visit to MSG. Why bother? He knows it will only add fuel to the fire. 19. He’s not playing second fiddle to Dwyane Wade – Yes, Wade and James have mentioned how great it would be play on the same team, and how they would tear up the court. But this works best when both of them go to a new team together. That means the new team is both theirs equally. No second fiddle. Let’s be clear. The Heat is Wade’s team. If LeBron goes to Miami, he’s going to Wade’s team. Just like when Shaq went to L.A. It’s Kobe’s team. 20. Cleveland has no great rivalries – Kobe said it best on Christmas that there is no rivalry between the Lakers and Cavs. Frankly, no team has a strong rivalry with the Cavs. They were so bad for so long. And the nearest teams in Chicago and Philly have more natural rivalries with other teams than the Cavs. Great rivalries are beyond current players, they are built over many years. The Knicks have rivalries. If Wade stays in Miami and LeBron comes to NYC, that’s a rivalry waiting to continue from the Riley days of the 1990s. Not to mention rivalries with the Bulls, Celtics and Sixers. And I bet Knicks-Nets becomes an interesting rivalry after Prokhorov’s purchase. 21. Lebron is not a Miami kind of guy – I just don’t see LeBron as a South Beach kind of guy. Basketball is a winter sport (unless it’s playground ball, of course). Wade, I see as a Miami person, so I don’t think Wade will leave the Heat. 22. If it’s only about money, how come he hasn’t signed an extension already – People talk about how the Knicks can’t offer him more money than the hometown Cavs and so they are not as attractive. If that is the case, why hasn’t he signed a max extension with the Cavs by now? It is apparent that LeBron, at a minimum, is excited by the possibilities of free agency. This can only help the Knicks. Plus, I think this hometown max contract being more than what other teams can offer is overblown. The annual max percent raise is 6% vs. 8% (or something like that). Yes, it makes a difference, but for someone like LeBron that can easily overcome that in external opportunities in NYC, I don’t think it’s an issue at all. 23. Winning, loyalty or immortality – Bill Simmons of ESPN said it perfectly, “It’s one of the greatest sports decisions I can remember: LeBron can choose winning (Chicago), loyalty (Cleveland) or a chance at immortality (New York) (ESPN link)”. I think if most of us had a chance at immortality, we would take the risk and go for it. It will be interesting to see which of these three traits he goes for. And here are additional reasons why I think he will at least leave the Cavaliers. 1. He did not pick the Cavs, they picked him – People seem to forget that LeBron did not choose to go to Cleveland. The Cavs notoriously tanked the two season prior to the LeBron draft in order to get the highest chance to win the lottery. They needed him more than he needed them. LeBron had no choice. He would’ve simply gone to anyone that won the lottery. Now is his first chance to choose where he wants to go. 2. His loyalty lies with Akron, not Cleveland – It was interesting that at his MVP Award ceremony this year, he pledged his loyalty to Akron, not Cleveland and not Ohio. This might be a subtle choice of words in distinguishing where his ultimate loyalty lies. Additionally, he choose to have it at the University of Akron, instead of somewhere in Cleveland. 3. Cleveland had seven long years to give LeBron a title – As much as people say Dan Gilbert, the Cavs owner, has an emptyless pocket to surround LeBron with the pieces to win, the truth is all the moves have been more like 80% effort. Bringing in Shaq as sloppy fourths after the Heat, Lakers and Suns had a turn was not the wisest choice. Plus, the addition of Jamison was also suspect. Here’s a guy that has played for only Golden State and the Wizards in putting up his numbers. His age and lack of playoff heroics made him a risky addition, considering how much they gave up for him. 4. Mike Brown and the coaching staff – Brown’s a nice guy and all, but he really is way over his head. By the end of the Cavs-Celtics series, it was obvious LeBron just didn’t respect the guy and the coaching staff’s ability to get the Cavs to the promised land. 5. Kevin Garnett’s strong words on loyalty – I know this is just some other player’s words, but it’s hard to ignore the truth behind Garnett’s words. ”Loyalty is something that hurts you at times because you can’t get youth back” Garnett said. On the same vein as my previous article, an argument that greed is the root of the steroids scandal in baseball, the current economic crisis and global warming, there is one other commonality among the three problems, a void of leadership. One can even argue that greed becomes rampant only at the behest or ignorance of the leadership. In the three problems stated, a lack of leadership for years is what has led to the current situations. Let’s look at the steroids scandal in particular. There is something special about baseball. Through all its scandals (Black Sox, race, recreational drugs, Pete Rose and gambling) it has always ended up doing the right thing and upholding the integrity of the game, even if it meant banning its all-time hits leader, Pete Rose, or several of its top players (Black Sox scandal – Shoeless Joe Jackson) for life. No player or players were above the game, and the commissioners knew this. The commissioners also knew they were not above the game and although they existed at the whim of the owners, they were supposed to put the interests of the game at the top. That list is too remarkable to ignore. The leader must be held accountable. Selig has been commissioner or acting commissioner since 1992, about the time hints began about steroids usage. Although he might not be the cause of the problem, he allowed it to fester and grow and grow. Players that would not have used steroids were eventually compelled to use it due to lesser skilled players on par with them now because of PEDs. This is simply human nature. It is now a scandal that won’t go away. As much as the players need to be held accountable for their actions, the leader also needs to be responsible for his lack of action.In any other institution where people are held accountable, the leaders are replaced by the board. The board of the United States, the citizens, overwhelmingly voted the Republicans out of office in the past elections. Even in corporations, strong board of directors have been known to push incompetent CEOs out. However, similarly to baseball, when the board is closely tied to the leader, this almost occurs too late. In baseball, when the owners overwhelmingly approve of an incompetent commissioner that was once an owner himself, then the checks and balance system fails. In my previous article, Baseball as America’s Pastime continues to fall further into the past, the popularity of baseball has decreased more and more as society’s attention has shortened. To compensate for such pressures, Selig’s actions were always for short-term gain (ie interleague play) at the expense of long-term interests. The need for greed. And they all fall. What Arod, recession and global warming have in common. What is going on with the world today? Many of the institutions and systems we grew up with and believed in have crumbled faster than a crumb cake in front of Santa Claus. This morning sports fans were shockingly (or not) met with news that one of the few remaining baseball superstars to not be tainted by the steroids scandal, Alex Rodriguez, failed an MLB steroids test in 2003. Considering that this news was corroborated by four independent sources, and based on past evidence of such news, this story likely has meat behind it. As the Barry Bonds’, baseball’s all-time home run king, steroids perjury trial heads to court, we wonder if there is anything sacred anymore in sportsmanship and fair play. The list now includes Bonds, Arod, Marc McGwire, Sammy Sosa, Roger Clemens and Raphael Palmeiro. All were heroes and idols to millions and millions of kids and sports fans. Sports is nothing, however, compared to the deepening economic crisis affecting the country. But, then again we need to ask ourselves how did this country fall into such a dire situation in the first place? With news of unemployment reaching 7.6%, worst since 1982, most Americans are sensing a pessimism in the country and its leadership they have never felt before. Corporations that have long been stalwarts have wilted after years of trustworthy service. Fannie Mae, Freddie Mac, Bear Stearns, Lehman Brothers and AIG, just to name a few. Even General Electric has fallen on tough times due to untrustworthy leadership expectations and financial exposure. Then there are the frauds of individuals, such Bernie Madoff, and corporations, such as Enron and Global Crossing. Then there is the global warming and energy crises. Due to the irresponsible and rampant use of oil and other natural resources, and the irresponsible output of chemicals into the air, river and ground, the natural balance of Earth has come under question. Dire predictions of sea levels, global temperatures, forestation, glacial coverage, droughts and diseases have left us wondering is there any hope left? Will there exist a viable Earth in 100 to 200 years? It is truly amazing that all three of these problems have one major thing in common. Greed. Greed. Greed. What is most disturbing is that the situations did not become problems until the ultimate greed kicked in. Arod was already a once in a generation baseball player back in high school. It is fair to say that he did not do steroids as a teenager as his body structure was simply too small. Bonds was a skinny player with the Pirates but was already a five tool player on the path to the Hall of Fame. McGwire was an amazingly talented rookie with the Oakland Athletics. Why did they feel the need to use steroids and become even better than they already were? Why risk already amazing career trajectories with such greed? Similarly, the financial companies that have gone bankrupt or bought up were very viable and successful companies (some for over a hundred years) before the ARMs and hedge funds became en vogue. Why the greed to do such risky investments in order to raise the bottom line and stock price? Was it all due to increasing stock compensation packages of executives? Was it all worth it? To dupe millions of unknowing citizens just for more personal money? What about Madoff? An already well-respected and wealthy investor; what caused him to risk everyone’s money (including hundreds of other wealthy individuals and companies), just to make more money for his firm? Finally, the earth has remained relatively stable ever since the existence of man. However, since the Industrial Revolution and especially since the widespread use of combustible engines, there has been this disregard for the side effects of using such resources. Coupled with research in biochemistry and synthetic compounds, the effects of pesticides, mercury, lead and carbons have led to a precarious global balance. Millions of animal species extinct or on the brink of survival. Are humans, the supposedly most “intelligent” species with opposable thumbs, in fact, the dumbest species ever? Just imagine outsiders writing about the history of man and what they would write about, especially the past 150 years. Just imagine what they would write about western civilization. Just imagine what they would say about the population numbers. Or about technology and medical research? Is this the final goal of evolution? We have reached the ultimate in special survival… our only enemy is ourselves? The whole purpose of natural selection is the survival of the strong. However, part of natural selection is natural balance. A species never wants to become too powerful because then their food sources and natural enemies would disappear. Humans have, in essence, overcome both these natural laws. Through natural selection (our brains and opposable thumbs) we are far and beyond the most powerful species. In a relatively short time, our population and power increased beyond control. Humans have no more natural enemies. The machines we have created are unmatched and only destructible amongst ourselves. So what does this all mean? The human world does not have a checks and balance system. Nature and other species have always acted as the equalizers. The closest thing that comes to that is the United Nations, and everyone knows how ineffective it is. Additionally, idealistic political systems such as communism and socialism have proven futile. Even checks and balance systems, such as the one in the United States, has a limited efficacy, as witnessed by the politics, lobbyism and other issues. Nature is having a difficult time balancing the effects of human greed and power. Diseases and natural disasters are becoming minimal in damage due to medical research and better disaster predictions. Without any natural enemies, we are left to govern ourselves and our future. As exciting of a possibility that is, the track record of that has been phenomenally pathetic.